Captain Chris Mitchum with the city of Alexandria, Louisiana was on the second due engine at a two-story residential building with heavy smoke and fire showing on the first floor. The first due crew was working on the fire at the front door, and Captain Chris and his firefighter were assigned to the second floor to check for fire extension. First due company knocked the fire back and made entry through the front door. Captain Chris and his firefighter followed suit, and proceeded to the stairway which was to the right of the door. When they made it to the top of the stairs, they were met with absolutely zero visibility and high heat conditions. There was a huge commotion at the bottom of the stairwell, and simultaneously, the heat began to rapidly increase and they lost their hose line. They searched for an egress point, which came to be the bedroom window on the Charlie Delta corner. Luckily, they were able to bail out as the third arriving engine company began their attack with a 2 & ½” attack line. All in all, both first responders made it out okay, with the exception of a few small blisters on Captain Chris’s face. It wasn’t until he made it back to the station that he found out how he got them. 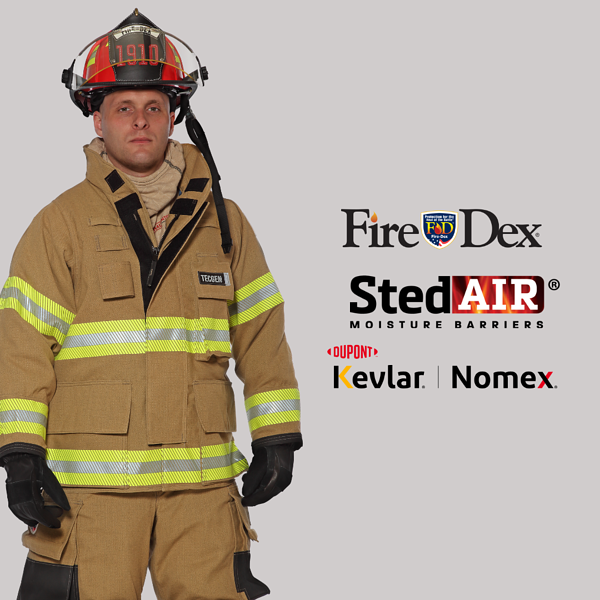 As a manufacturer of firefighter gear, we don’t always get to hear about how our products are performing in the field. That’s why we rely on feedback from customers like Captain Chris. We use that feedback to make product updates and ensure continuous improvement on all of our products. Do you have a story or testimonial about one of our products? We’d love to hear it!